Today I’m reporting on a pretty guilty pleasure, Imagination. I’d seen these guys on Top of the Pops and was, at the time, pretty impressed by them. I have to admit I quite liked the single Just an Illusion. 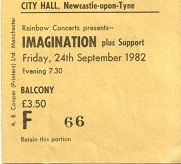 So when Imagination came to Newcastle City Hall, I went along to see them. The show was quite over the top, and featured tracks from their first two albums. Looking at the programme today reminds of just how over the top these guys were. 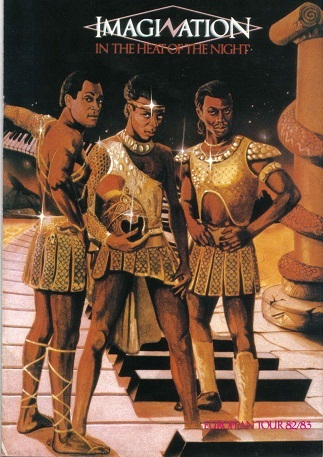 The cover of the programme shows them sporting the most outrageous togas, and inside there are pictures of the band wearing some very glam gear, including one of singer Leee in what looks like a glittery nappy. Imagination were actually pretty big for a short period. From Wiki: “Imagination were a three piece British soul and funk band, who came to prominence in the early 1980s. They had chart hits in 28 countries, earning four platinum discs, nine gold discs and more than a dozen silver discs around the world between 1981 and 1983.” The members were Leee John, Ashley Ingram and Errol Kennedy. Support for this gig came from the Techno Twins, who were a dance and techno act and were an influence on many bands who followed. Like many bands Imagination, and this gig, were very much of their time.